Description:This print was commissioned by Dr. Robert Plot for his book 'Natural History of Staffordshire', published in 1686. The moated house of Norbury Manor was built by Ralph de Botiller in the early fourteenth century. In 1521 Norbury Manor was sold to a lawyer, Thomas Skrymsher. By 1775 the estate became the property of George Anson of Shugborough. By the early nineteenth century the building was in a dilapidated state and lived in by farm workers. In 1838 the building was demolished and a new house was built further to the south, using stone from the old manor house. The remains of the moat can still be seen approximately half a mile to the east of Norbury village. 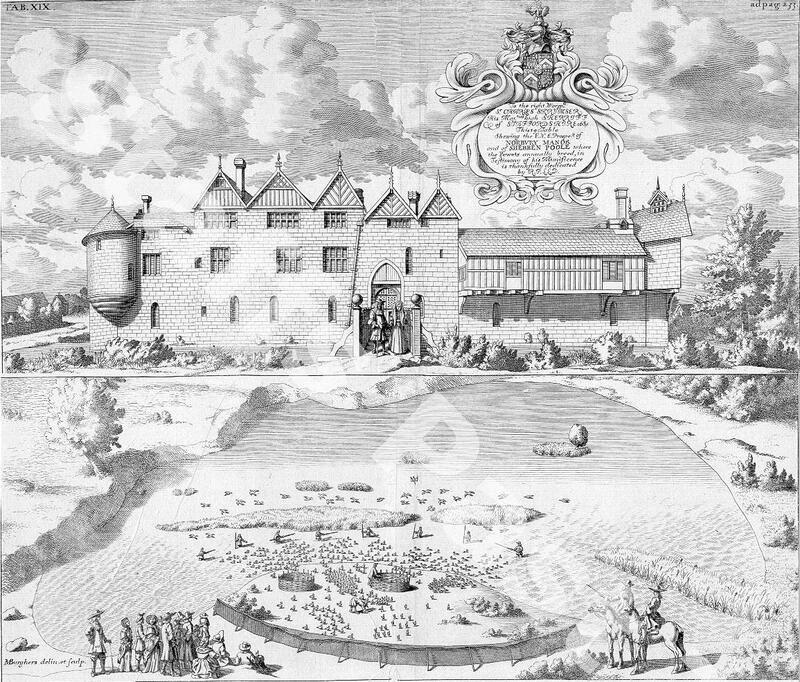 The lower half of the engraving is of Shebdon Pool, which gradually disappeared as the land was cultivated. The 'peewits' as mentioned in the caption are black-headed gulls, not lapwings. They bred here and were caught for food. According to Plot the pool lay 1/2 mile south-west of Norbury Church.